Austin, Sheila and Oliver Stack enter Government Buildings today. THE FAMILY OF Brian Stack, the Portlaoise Prison officer shot by the IRA in 1983, have met with the Taoiseach Enda Kenny and Tánaiste Frances Fitzgerald today. Brian Stack died 18 months after was shot in the neck as he left a boxing match in Dublin in 1983. The Provisional IRA later claimed responsibility for shooting, but no one has ever been brought to justice. The issue was raised around last year’s general election and dominated headlines coming up to Christmas. That led to the family being invited to meet the Taoiseach and Tánaiste today. The family has long accused Sinn Féin leader Gerry Adams of lying over how much he knows about the murder. In a statement after the meeting, the family called on Adams to retract his statement saying Austin Stack breached the confidentiality of a meeting between the two, while recalling their lost father and husband. “My father was a loving, caring and wise man, he was loved not just by his family but also by his community and colleagues. We have received a large amount of messages of goodwill and support over the last number of weeks from former colleagues and the ordinary people of Portlaoise and beyond. We would like to thank each and every one of you who got in touch, your support is very much appreciated. On 25 March 1983 as my father walked down Washington Street in Dublin after attending the National Senior Boxing Finals, he was shot from behind in the most cowardly way possible. Deputy Adams has tried over the last few weeks to contextualise the murder of my father using terms such as “war” and “combatant”. The statement goes on to describe Adams as “holding himself above the law” and called for him to be questioned by gardaí. If Deputy Adams does not present himself to the gardaí we would fully expect that they would take steps to have him questioned. 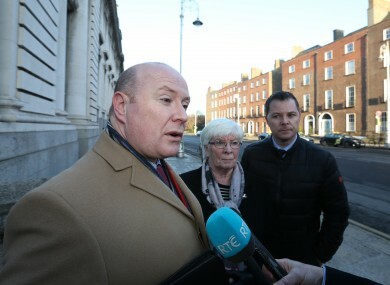 In a statement, the Taoiseach’s Department said that the parties had “greed to follow-up on a number of these issues and get back to the family in the coming weeks”. Email “'My father was a loving, caring and wise man' - Stack family meets the Taoiseach”. Feedback on “'My father was a loving, caring and wise man' - Stack family meets the Taoiseach”.